This is a very nice, reliable, and affordable overdrive pedal. I think this is somewhat mid-range focused and that it is suitable for leads, as opposed to many "distortion" pedals that are mid-range scooped. My only concern is that it is rather noisy. Other than that, this is a great sounding overdrive pedal. You just can't go wrong with Boss pedals. Playing guitar for 30+ years but I was never a gear expert. I?m kicking myself now for not buying this earlier. As someone else pointed out, the only "bad" point I found is some background noise if the Level gets turned up past 2:00, but I can't imagine turning it that high - It's an overdrive, not a boost. Short Version, fantastic creamy OD and I like the sound better than many of the more expensive ones I've tried over the past year (like the BOSS Blues Driver, Tube Screamer, EXH Soul Food, to name a few) Longer Version - I'm in the process of building up a custom pedal board to play with other friends my age (mid-40?s) and potentially get back into playing in public. I have a Golden Brownie for heavier OD (AC DC, blistering guitar solo type stuff) but I wanted something for the more mid-range stuff ? Brian Adams, Black Crows, Loverboy, etc? In terms of planning the final pedal board, overdrive/distortion/dirt has been a big one I've put a lot of effort into. 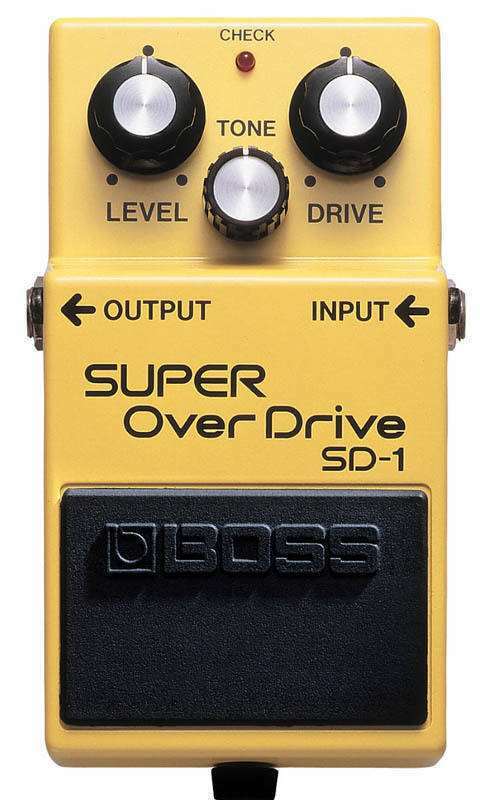 Important thing to keep in mind, like all true overdrive pedals, the SD-1 will behave very differently through different guitars/pick-ups/amps/ and set ups. I play a 2004 telecaster with a little 59 humbucking-style bridge pickup and set-up to accommodate 11 gauge strings. I'm playing through a blues junior (all EQ set around 7-8 and Volume set at 4). So, my dry signal is mostly clean; you get a little bit of ?hair? if you strum really hard. With this pedal set to Level (12 o'clock), Tone (2 o?clock) and Drive (between 11 and 12), you get a full creamy responsive overdrive. In fact, while I was testing the pedal in the store (brought my guitar and plugged in to a Blues Junior in the show room) these two guys came up to me and said ?Man, what is that pedal ? you are getting such a sweet tone). And now that I?ve brought it home, it fits in my board (between my compressor and my heavier OD pedal) and has caused no signal loss, background noise, or other issues. Anyway, I can?t guarantee you?ll get the same results through your gear, but for $59, this thing really seems like a steal to me. I tried Maxon od808, Boss SD1, Electro Harmonix Soul Food, Ibanez DS9, and I chose the Boss SD1! Maxon od808 have a tighter sound but less bottom and it sound tinner compare to the boss SD1. The other ones are not my cup of tea. Boss SD1 is Perfect to boost up a tube amp, and it really sound as good as the Maxon od808. Very simillar. For the price you can't go wrong with this one! It really rock's hard! Once you will tried it you will buy it. Why pay more. Got this used after setting out for a behringer over drive, treid them both, this is 100% better easier to use better tone etc, this is affordable but just as good if not better than some ridiculously expensive, get this one! I got this as a christmas gift and this pedal works great, i run it trough my board and used it as a boost to my eh octavix and also used my donner blues drive to boost this boss pedal, ive been super pleased with how great i can get it to sound, its very verisitile and its priced amazingly, boss pedals are tough and look great on your board, i play on a yamaha thr10 and they sound terrific on the flat channel. I bought this pedal on boxing week there were tons of pedals that were way cheaper than normal. I had about $100 dollars to spend. This was better than all of them that I tried expect the ts808 but that was to high priced. I bought it and it sounds great. I love how low priced it is but still sound great. Buy this pedal, God bless. this is a great pedal and has many of the same internal components as the far more expensive ibanez ts-9 and sounds within 5% of the ibanez pedal.you do not need to spend $100,$150 or $200 for an overdrive. you will not reap any benefit whatsoever. i turn the drive off completely,turn the level up and keep the tone at about half and it just pushes the harmonics and gain of your tube amp without coloring the sound of it at all. Ive been in several bands,and this is definitely a keeper and always has a place on my board. I love the tonal characteristics of this box. It is a little meatier than a tube screamer and does not roll off nearly as much bass as the TS. Here is what I dont like about it and it could be because it is a $60.00 pedal and mass produced in Taiwan. This thing produces a fair amount of un-wanted noise when both the output and gain are pushed past 12 oclock. I like to use these boxes as a boost so I like to crank the output and leave the distortion at a minimum but enough for some of the pedals clipping characteristics to come through. I find even on this setting if I am not careful I can generate unwanted noice when using it on a dirty amp channel. All in all it is a great pedal and lots of pros are using it (most likly moded to improve components). I would definitly recomend speding an extra $40.00 and going for the MXR Zakk Wylde OD. It is an exact clone of the SD-1 with a touch of mid scoop compared to the SD-1. It is also true bypass and it doesnt produce the unwanted noise when hammering on the output or the gain. Definitly worth the extra $40.00 to get the SD-1 sound in slighlty better components. The features are basic Level,Drive and tone. I had this on my pedal board for years , this was my main guitar tone with with my Marshall JCM 900 for years and years live and for the first Tracenine recordings , until getting endorsed with Mesa Boogie, however I keep this very same pedal in my guitar case it goes everywhere with me, for jams and live just in case back line amps dont cut it, my Boss pedal is ready to rock. Also i will use the overdrive pedal for solos if the amp doesnt have channel switching. You cant go wrong for the price its amazing . I cant stress how much I will always love this pedal . regards less of my endorsments I will continue to squeeze it on my pedal board somewhere to add the crunch and harmonic tone to my amps. buy it and enjoy it. cheers . I've owned this pedal for four years or more and it works excellent. Produces a crunchy sound that replicates a tube amp very well - as good as a pedal can at least. The input and output are very sturdy with no slop. The knobs are also very sturdy and the whole unit is built well. The only concern I have is that the battery wires inside the unit seem very fragile but this is the same with every pedal I've used. Otherwise it's an excellent pedal and worth the price.